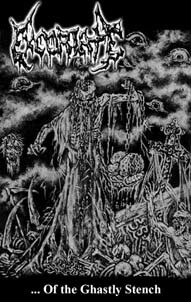 www.Terrorizer.com - View topic - EXCORIATE (Chile) ... Of the ghastly stench Tape out now! The first review of the EXCORIATE Tape was published on VOICES FROM THE DARKSIDE Webzine, Ir’s a very good review! Trois nouvelles chroniques d'EXCORIATE ont été publiées! One prevalent thing that I have noticed about record labels these days I that more and more of them seem to have a target audience – More so than merely being a ‘Metal’ label, for instance (such as is the case with Nuclear Blast). These days many smaller, more specialized labels can be found, who focus on one specific subgenre and almost or completely exclusively record and release bands and albums from within this genre. One such example would be Nihilistic Holocaust, whose main focus is on underground Death Metal, the way it is supposed to be played. The newest record that has found its way across my doors threshold from this label is called … Of The Ghastly Stench and is the fifth release from Chilean Death Metallers Excoriate – A true underground act, both in sound and in releases. All of said releases have been either Demos of Split albums, and … Of The Ghastly Stench is no exception, being a Demo Tape (as far as I can tell, the band almost exclusively sell their records as cassettes) showcasing four old-school tracks, which combined roughly hit the half-hour mark. Now, for those of you who are expecting an exciting new release pushing the boundaries of what Death Metal can and cannot be, whether that is a more melodic approach or perhaps combined with another genre… You will not find what you are looking for. What you instead will discover, is a throwback to what the genre was back in the late eighties, when bands such as Bolt Thrower Suffocation and Entombed reigned supreme. Excoriate magnificently encapsulates everything that made the genre great as well as showing off what muscle this musical approach had both back in the day, but even more so today. Excoriate has a very slow, bas-fuelled approach to their music, something that I personally rarely see these days (perhaps I would if I delved more in the Doom Metal genre – But I digress). This is very evident on both the introductive track ”Teofisto”, as well as the first actual track ”Oh! Peaceful Derketa”, the coherent sound of which is a prime example of what this Chile-based quintet is capable of. A release for fans of the old-fashioned Death Metal approach (and as such it is aptly released on Cassette), one recommended for fans of, as stated above, fans of Bolt Thrower, Sufocation and Entombed. When ‘…Of The Gastly Stench’ arrived at my doorstep, I guessed the mighty Exmortis (U.S.A.) finally was resurrected from the grave. After a second look I figured out I was wrong. Excoriate’s logo has some similarities with Exmortis’ logo I think. Anyway, this is Excoriate I’m talking about here. The band hails from Chile, has released some demo’s and splits with Demonic Rage (‘Death Communion’) and Horrifying (‘A Dismal Journey To The Oblivion’). Reviews of the EXCORIATE tape keep on appearing! Here are five new chronicles about their doomy tape! Excoriate's ...Of The Ghastly Stench drips and dangles it's murk into your brain with dangerous effectiveness. This death doom mixture is the result of over ten years of refinement in their trade. There is a lot here that reminds me of other South American death metal such as Mystifier or Headhunter DC, but also there is a twisting usage of melody akin to the Dutch scene. There is also something nostalgic about the presentation overall; the raw and unrefined guitar tone, the black and white cassette j-card, the improper capitalization of song titles, and the overwhelmingly swampy sound of the four tracks. The pacing on this release is spot on. "Teofisto", an instrumental introductory track sets the stage for the expertly twisting "Oh! Peaceful Derketa", which slithers and never truly clicks into a predictable rhythmic pattern or style. It's something which Excoriate do particularly well which befuddles other bands. What could be construed as the chorus in the track is an instantly memorable riff which drops at all the right moments of the track. Midway through the six minute long song-arc, Excoriate borrow some rhythmic influence from Celtic Frost in transition to a slowish section with creepy bass melodies which further morphs into something not unlike the iconic - iconic to me, at least - "Osculum Obsenum" from Mystifier's Wicca. Where "Oh! Peaceful Derketa" is a slower, brooding track, the pace picks up with "Black Streams on the Ground of Cruelty," but the unconventional riffs and melodies are retained at the quicker tempo. Francisco Rojas experiments heavily with guitar leads and noisy tremolo runs to cast a demonic and evil cloud across final track, and one of the best song titles I've heard in a while, "Ghostly Stench of Mortal Remains." It's the better of the two faster tracks for me, with a seemingly non-repeating main riff full of shifting power chords under flowing tremolo patterns. The song writhes under the serpentine tremolo riffs. Drummer Lino Contreras and Vocalist Fernando Olivares somehow manage to know where the song is going, and while I find it hard to follow from a structure standpoint, it's engaging regardless, and never gives the impression that the band is also lost. Excoriate take a death metal foundation and finding a way to give it an identity they can call their own style. It's easy to appreciate a band that offers something fresh in each song, never rests on tropes or a stereotypical stamping and pasting of barely nuanced riffs. ...Of The Ghastly Stench is moist, dark, brooding, and definitively creepy. If you've ever claimed there's no good death metal coming out in the early 90's vein, Excoriate stands to correct your assumptions. Nihilistic Holocaust did right by putting this tape out because it deserves some recognition. I'm off to find Excoriate's earlier demos and material. The band Excoriate is a unique entity. 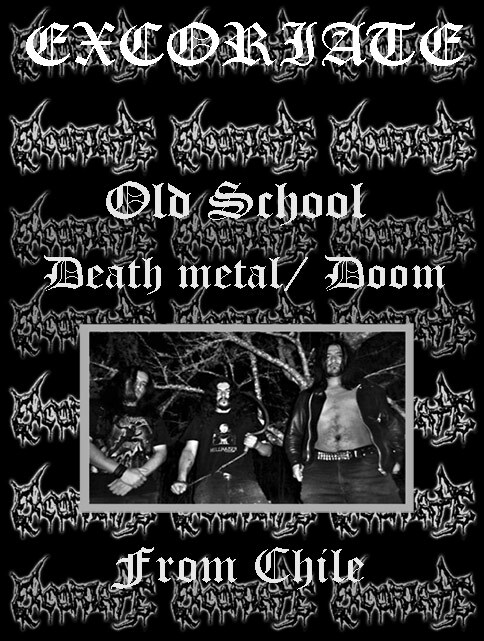 This band is from Chile and is not the other death metal band from Germany with the same name. Their latest venture into the swampy wastelands that inspire their artwork and sound is called …Of the Ghastly Stench. Is it wise to label a band so multi-dimensional and anti-typical? No. 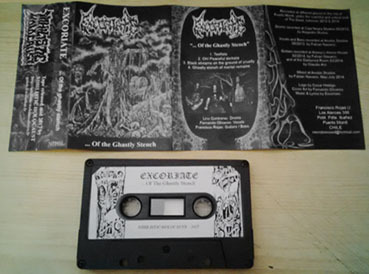 Excoriate is part old-school death metal, doom, first wave black metal a la early Varathron, besides others I can’t name out of consideration for the band’s originality and my unwillingness to pigeon-hole the band’s sound and approach to songwriting. Really, some folks may think of them as doom/death and may well have credence. But, I hear more than that in Excoriate’s platter of four tracks. It is wise to simply note that this band is old-school, and don’t simply subscribe to trends. The guitars are captured by the production nicely. Not just gritty and sludgy, the guitar tone sounds like it was channeled out of outdated equipment. Even then, the guitar riffs aren’t muddled like they would be had they been outputted through a karaoke. The bass is audible, and both snare and bass drum thud in old-school death metal fashion. The vocals are part doom/part old-school death metal, and also remind me of Varathron circa His Majesty at the Swamp. Did I enjoy this festering brew of unidentifiable, anti-typical elements amalgamated into an obviously-toxic substance? Yes. And while …Of the Ghastly Stench is nowhere close to His Majesty at the Swamp’s brilliance and grandeur, doom/death fans who like the sound of the early eighties Sabbath-inspired doom/death hybrids will love Excoriate to bits. In this day and age, most doom/death sounds rather same-ish. Excoriate doesn’t. And, to add to that, Excoriate don’t intend to be compared to Varathron’s style on its landmark album, so it isn’t fair to do so and declare them unworthy of that comparison. …Of the Ghastly Stench simply reminded me of that lost recording, and that comparison should only be perceived positively. People inclined to misunderstand said comparison will declare Excoriate unworthy of said comparison, and I don’t intend to throw Excoriate under the bus like that. So, regard your lesser capacity at comprehension with responsibility for once and not make that mistake and take my words lightly, should you have little else to do but troll writers who don’t intend to defame poor young bands. …Of the Ghastly Stench is not an album I typically herald with high praise, but I would like to emphasize to old-school doom/death fans that they should check this release out. I enjoyed my time listening to Excoriate, and doom/death fans who want to hear Sabbath groove and early death metal first fuse wonderfully should exert due effort to get a copy of this now. No voy a ponerme a escribir el baile de estudios donde se ha grabado este trabajo porque me parece meter palabras por meter. El caso es que estos Excoriate celebran sus más de doce años de vida lanzando en casete las cuatro canciones que ya fueron editadas en un compartido de hace dos años con sus compatriotas Horrifying y el sonido, pese a usar varios estudios, es el adecuado. Lo que tenemos es un saturado Death Metal de bajo prominente, batería comedida y guitarras saturadas en “Teofisto”, la intro que abre para estos casi veinte minutos que continúan con “Oh! Peaceful Derketa”, pieza donde la melodía se desarrolla en una composición de sonido noventero y que llena cada milímetro cuadrado de los altavoces de mi cadena. También hay espacio para ritmos lentos y acordes arrastrados, cercanos al Doom para un tema extenso.“Black streams on the ground of cruelty” es un salvaje tema con sonido de garaje, ritmos sencillos y atmósfera oscura y opresiva y “Ghostly stench of mortal remains” (sé que el trabajo se titula “...Of the Ghastly Stench”, pero yo he copiado lo que viene en el libreto) comienza con un melódico y rápido solo de guitarra apoyado por una básica sección rítmica. Un Death tosco y brusco cuyas voces traen diferentes ecos blackers, si bien el sonido de los instrumentos nos conducen por el camino citado del Death Metal de los años noventa. La cosa acaba tan rápido, eso es siempre buena señal, que me he puesto varias veces este notable y adictivo “...Of the Ghastly Stench” y no me canso de escucharlo. Las influencias en las que se centra son tan oscuras como variadas y pueden recordar tanto a los primeros Celtic Frost como a Morgoth o a Bolt Thrower e incluso a Possessed. El arte interior se presenta con logo de César Hidalgo y básica y tétrica portada del propio vocalista Fernando Olivares. Si indagas un poco por la web seguro que puedes dar un vistazo al diseño completo. Musicalmente es un trabajo logrado e ideal para la gente que suela buscar el sonido que se hacía treinta años antes.